This spiral-bound Catechist's Manual is a priceless gem for catechists who serve within the parish RCIA catechumenal process. It was designed by a team of clergy, catechists, directors of religious education, RCIA directors, diocesan officials, and theologians to be a practical help for catechists as they craft the catechetical portion of any RCIA session. 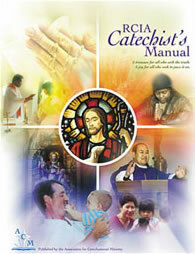 Each copy of the Catechist's Manual comes with a free copy of the RCIA Overview Chart. Now, we will examine the different sections of the Catechist's Manual using the table of contents as our guide. This section is very short: only 2.5 pages, and it explains the following sections. This section provides a summary of the structure of the RCIA process, offering a basic context for the following sections that elaborate upon the catechetical aspect of the RCIA process in detail. The liturgical and pastoral aspects of the RCIA process receive much more significant treatment in the RCIA Leader’s Manual. The RCIA ritual book tells us that catechesis should shift in emphasis (and in method to some degree) as a participant goes through the process (see RCIA, no. 4-7). This section explains in practical terms how those changes serve the process and help foster conversion. It’s important to note that the lesson plans provided in this Catechist’s Manual are primarily written for the Period of the Catechumenate. Each one of the 60 lesson plans included in this manual are designed uniquely according to a structure developed by Msgr. Francis D. Kelly in his book titled The Mystery We Proclaim: Catechesis for the Third Millennium. This section's 8 pages are indispensable for someone who wants to glean the most from the Catechist's Manual. Ever wondered how to develop a curriculum within the RCIA? This section help you build the skills necessary to determine what to teach when. The General Directory for Catechesis tells us: "The various elements of the Christian faith should be presented in a well structured way and in harmony with each other by means of an organic vision that respects the 'hierarchy of truths'" (GDC 241). This section aids the catechist in making clear the connections among the doctrines of the faith, so that the catechumens and candidates are able to grasp the unity of the Catholic Faith, to see how every truth that we believe is important and connects with every other truth in a harmonious fashion. This handy table helps you choose which handouts from the RCIA Participant's Book to give out to participants according to which topic above you choose for an RCIA session. This section offers three examples of how parish RCIA directors and catechists have used the principles discussed in the introductory sections of this Catechist's Manual to determine an initial ordering of their RCIA teachings. Each lesson plan contains definitions of key terms. This glossary is a compendium of all the key terms found throughout the 60 lesson plans. Each lesson plan contains recommended hymns and songs for that particular catechetical topic. This section is a simple alphabetical index of all these hymns/songs. These are wonderful recommendations of Scripture passages and hymns to use in lieu of what you will find in the Lesson Plans if you are in the seasons of Advent, Christmas, and Lent. This 5-page section explains how Lectionary-based catechesis does not suit the demands of systematic catechesis because the Lectionary does not follow the hierarchy of truths from Sunday to Sunday. This appendix presents numerous citations from prayers of the Mass in the Roman Missal (a.k.a. the Sacramentary), from the sacramental rites, and from other rites and blessings of the Latin Rite that show how the doctrines presented in each lesson plan are prayed in the Church's liturgy.